Oddly familar view? It ought to be! 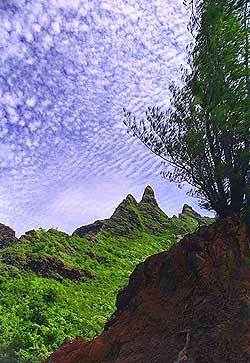 If you've ever seen the movie musical "South Pacific," you've seen these peaks. They were often glimpsed over the actors' heads from the "nurse's beach" area... Luckily, quite apart from any associations with Hollywood and WWII, these peaks are memorable and very striking in their own right. To reach this viewpoint, you must drive to the end of the highway past Princeville and then hike the steep, mucky trail which leaves Ke-e Beach and heads west towards the roadless Na Pali Coast. This is the rainy side of Kauai, and the vegetation is definitely lush jungle, with unique flora and fauna. Ke-e Beach. Road's End. 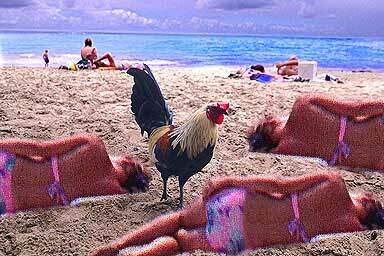 No kidding...A jungle beach where sunbathers mix it up with wild chickens!